The demonstration took place just days after she fled a Mexican restaurant in Washington while being heckled by protestors. The protest, organized by the progressive group CREDO Action, took place at 7:30 a.m. In the pouring rain, protestors shouted several chants over megaphones, held posters that read “Child Snatcher” and played the audio clip released by ProPublica over a speaker system. Claudia Quinonez, who spoke at the protest, said that she felt empathy for the detained children because she could have been in a similar situation. She arrived to the United States as an undocumented immigrant in 2006, and is currently protected under the Deferred Action for Childhood Arrivals program. Nielsen, who was home at the time, had to walk by protesters shouting “Shame!” as she left her house. President Donald Trump signed an executive order to end his administration’s policy of separating migrant families apprehended at the border this week after intense criticism from both Democrats and Republicans. 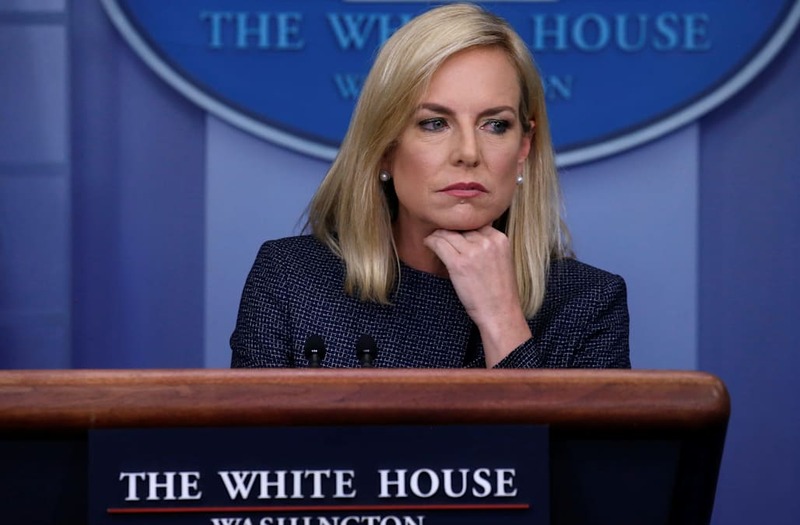 Trump claimed that the “zero tolerance” policy would remain in place, but parents would now be detained with their children.